Today I finally said goodbye to Visual Basic. 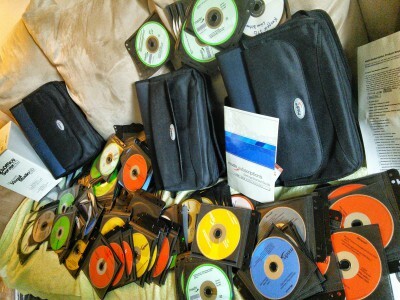 I made a decision to throw out hundreds of DVDs containing software worth thousands of dollars. For about six years, I was awarded Most Valuable Professional by Microsoft and because of that I annually received two complete Microsoft Developer Network subscriptions, one from Microsoft Japan and one from Microsoft U.S.A. I have finally decided that I will never need to install or use this again, even though it was a big part of my life for so long. The software, programming books, computer hardware and other perks, came to me because of my work with the Visual Basic programming language. VB allowed me to create some pretty good software and I really loved it. I used VB from version 3 through version 6 and I would probably still be using it today if I had the choice. Unfortunately, Microsoft made a very misguided attempt to re-invent the language starting in about 2001 and decided to change it into something totally different. In 1994 I joined a high-tech Japanese company in Yokohama, Japan and so I moved from a hobbyist in the BBS world, using command line FTP clients and dial-up modems, to a professional developer with access to multiple T1 connections, cutting edge hardware and a whole new internet protocol called http using “browsers” like Cello and then Mosaic. The world was getting smaller and that was fine with me. Being an American living in Japan, I really loved the fact that I could communicate with anyone, anywhere for free over the internet. It was sort of like short-wave radio, only so much better, and there was a whole world of servers and new technology to explore. In the early 90s the smartphone had not been invented yet. Internet giants like Yahoo, Google and Facebook had not yet appeared. Killer applications like Wikipedia and GMail were yet to be invented. Videochat was a new and exciting emerging technology. In 1995 I was assigned to the Multimedia Product Development Division in my company and became part of the team that ported Cornell University’s iconic CUSeeMe software to Windows and to Japanese. We ran the official “reflector” servers for CUSeeMe in Japan and we hoped to sell lots of hardware webcams to the growing market of computer users in Japan. Eventually, it was decided that my company would try writing original software that made use of video so we could bundle that with our hardware inexpensively. I had been trained on programming languages such as ASM, C, and then C++. There were new languages popping up like Java that held great promise. But when I was assigned to write new software for Windows 3.1, I decided to try Visual Basic 3.0. I wrote a screensaver to learn the basics. Then I wrote an app to control playback of Video CD discs on Windows. Because there was a great community of developers on BBSs (especially CompuServe) who then migrating to the nntp (especially the Usenet) and eventually on to http websites, it was a great time to be learning about computers, programming and the internet. I learned from the VB masters like Dan Appleman, Matthew Curland, Karl Peterson, and the whole CCRP gang. Eventually, I was put in charge of a team that was developing an original videochat application software for Japan. By this time I was using VB4 and the big change from 16-bit Windows 3.1 to 32-bit Windows NT was happening. I spent about 12 hours a day working in Visual Basic and understanding the internals of 32-bit Windows and the way video-capture and video playback happens. By the time we finished the video software I was somewhat of an expert on using the the Win32 API and the Visual Basic programming language. The internet community had trained me and I felt it was only right to give back so I spent a lot of time helping to teach other aspiring VB programmers on the Usenet. 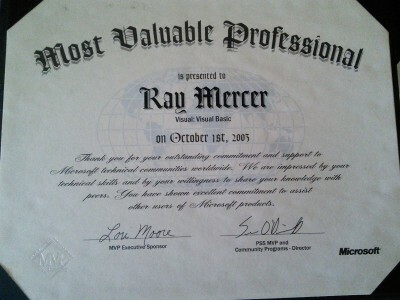 I was awarded Most Valuable Professional status by Microsoft the first time in 1999, and being a VB programmer felt good. It seemed like computers and the internet were still young, the possibilities were endless, and I had a great tool to explore everything the Windows OS was capable of. By now, I was a loyal VB programmer and I was loyal to Microsoft and MS Windows. In my spare time I released some free software tools written in VB. I even made some money on the side by taking contract programming jobs for custom sports and medical applications that used video capture. 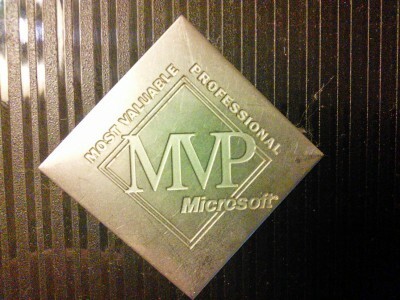 I continued to be awarded Most Valuable Professional status by Microsoft for five years. VB4 was better than VB3. VB5 was a LOT better still. VB6 was another improvement. I was making good money with my knowledge of Visual Basic programming. I assumed that things would just keep rolling and getting better. Microsoft was sending me goodies every month, software and hardware – even perks like buying items in the Microsoft employee store. When MS released a “Multimedia Jumpstart CD” for their new Windows NT Operating System, they included my software on it as an example to multimedia programmers. They even invited me to Redmond to talk about how I had done the video capture and compression and video overlay all in Visual Basic using functions already built-in to Windows NT. And then came the big surprise. I think it was in 2001 that Microsoft invited me and all the Visual Basic MVPs to Redmond and had a big event to announce VB.NET. The project manager for the new version of Visual Basic, tried to sell us on the new features of VB.NET but we soon realized that it had already been decided that VB as we knew it was going to die. I had the sinking realization that all of my old code and all of my expertise as a VB programmer was going to be thrown out by Microsoft just because they were afraid of the growing popularity Java (and indirectly Linux and also Google). Instead of letting VB be what had made it so popular they tried to leverage the popularity of the name and developer-base to sell their gamble on a totally new concept. The .NET team seemed driven by a vision of .NET becoming some kind of meta-OS that could take over and be ported to run on any Operating System. I got the feeling that they truly felt that all VB programmers would see how wonderful it was that they were going to change the language and even the purpose of the language. They simply felt that classic VB was holding back progress. I’m sure they sincerely believed that Java would take over if they didn’t sacrifice the Windows-centric API and COM based VB Classic and move as quickly as possible to some amazing miracle product. Now, over a decade later, it is pretty obvious that this was a mistake. This week Google rolled out a new feature to Gmail. Traditionally email clients, including Gmail, have always set “show images from sender automatically” off by default to protect the user from being tracked by spammers. The new Gmail client has changed this setting to on by default. Since Google now runs the largest email system in the world and their informal corporate motto is “Don’t be evil,” they can expect some scrutiny when they change how things have normally been done industry-wide. Some say that Google has found a way to protect us from being tracked and the new setting is good. But others disagree. I have read conflicting articles about it in Wired and elsewhere on the ‘Net. Is Gmail’s new show images by default a good thing or not? Is Google “Blowing up email marketers by caching images now” or not? In fact, this new Gmail roll-out contains a little good and a little bad. Let me explain. In the first section above we read that Google is protecting us from marketers having certain identifying information about our computer or our browsing habits (through IP address or cookies) and as always Gmail is great at protecting us from malware and viruses. I applaud Google for these things and I seriously love Gmail. It is the best tool I have ever used to battle the rivers of spam that flow daily and safely communicate with the world. Unfortunately there is another section below that. Notice these words, “In some cases, senders may be able to know whether an individual has opened a message with unique image links.” Look, I will be honest. I don’t want people to know when I listen to messages on on my telephone answering machine. After all, I might want to use it to screen calls. For basically the same reason, I don’t think it is “a good thing” if those who send me an email know – without my consent – the exact moment when I read that mail. After reading their official explanation it dawned on me what their real motivation could be. Google wants to be the one who decides who can track me and who cannot because they can then charge for that privilege! Just think of how much Mailchimp and others will be willing to pay so that Google doesn’t consider them “potentially suspiscious.” Yes, think about it – one of the biggest Email clients has gone to showing images by default and now Google has the power to filter which services can track mail with those images and which services cannot – through their own proxies. Whethe their motives are good or bad, the fact remains – the folks at Google have just quietly set themselves up as the gateway for email marketing for a very large percentage of the entire market. So for those who, like me, want to make that decision for themselves I recommend turning off “show pictures by default” and using Gmail as a useful tool under your control rather than the other way around. When iOS and Android started making waves a couple years ago, it took a while for a decent Android smartphone to come out in Japan. I waited patiently, for quite a while, until I saw what I liked. I do think I made a good choice with the HTC Desire. I bought the Desire from Softbank in April, 2010 and, because of production shortages of the AMOLED screen, finally got my hands on it over a month later in June. Having used this phone for well over a year now I am still quite satisfied with the specs. It has a 1GHz Snapdragon processor, a decent 5MB camera and good 720p quality video. The only negative I have found with this phone is that the internal memory seems to fill up quickly when installing apps. After the Froyo (Android 2.2) update came out from HTC and Softbank I expected this issue to disappear because moving apps to the SD card was finally officially supported. While there seemed to be improvement in battery life and new camera features after the update, I still got memory warnings even when I moved all the apps I could to external SD storage and had to finess the phone in various ways when I wanted to install new apps. Later on I learned that this is because a part of the OS called the Dalvik-cache is located in a smallish partition which, in hindsite, HTC maybe should have made a little larger. The following regional variants are not-compatible with this upgrade: Germany (Deutsch Telekom), North America, South America, South Korea, Japan, Turkey, and Arabic language speaking countries in the Middle East. Hmmm. I guess it works somewhere, but not in Japan or these other small countries listed? Since I want to learn more about WordPress I am working on a plugin that handles various login related tasks. Version 2 adds the ability to customize the login picture on the wp-admin.php login page. I found a plugin called “Login Logo” by Mark Jaquith which does exactly what I wanted to do and merged that code into my Login Widget (see this post for more info on the first Login Widget). Just a small widget to replace the default “meta” widget in WordPress 3.x Shows (localized) login link when user is not logged in or shows logout and server admin links when user is logged in. Does NOT show the feed and WordPress.org links. Unzip the file above to wp-content/plugins dir on your webserver. Activate “Ray’s Login Widget” in the admin console plugins page. Navigate to Appearance|Widgets in the admin console and drag the “Ray’s Login Widget” to a sidebar. Enter a title for the login link. Done. P.S. I learned from Justin Tadlock’s post here and from the default-widgets.php file in the WordPress 3.2.1 install (wp-includes/default-widgets.php). Option #1 looked good but it only works once per PC and also leaves registry bloat behind after the uninstall. Because I like open source software (always free) and because I happened to know about a great alternative to Illustrator, I decided to go with option #4. After installing the lastest Inkscape (currently at version 48.1) I found that Inkscape imports ai files natively pretty well. I was able to import the Illustrator CS4 file containing the business card template with no problems. I did have to specify the size, so I used a standard Japanese business card size. The file opened up in Inkscape and I was able to edit text and vector graphics. However I noticed that there was no export to Adobe Illustrator .ai format built in. I was surprised because I thought I had used Inkscape to export .ai files in the past. After a quick web search I learned that the .ai export feature was removed in Inkscape version .47. This is because Adobe Illustrator now (since version 10) supports importing .svg files, which are Inkscape’s native file format. This is good news but in my experience some Mac-based graphics designers aren’t too great with handling different file formats. So I was pleased to find that a separate open-source project exists who’s whole mission is to provide a convertor between the various vector-based graphic formats in existence. Not only that, but this project includes a patch script to run on Inkscape 47.x or 48.x which adds the specific functionality I was looking for. The project is called sk1project and the software is called uniconvertor. If you run Vista or Windows 7 you now have a new free anti-virus option called Microsoft Security Essentials (or MSE). When I first reviewed this product (before MS officially launched it) it was going to be a paid subscription option. Since there were free options available, I decided to ignore MSE and review only totally free options. Last summer I set up a new computer for my father-in-law running Windows 7 and when it came time to delete the 60day trial of Norton and choose a free anti-virus product for him I remembered MSE. In recent updates, PandaCloud has begun showing popup nagware screens urging users to update to the “Pro” (literally – “Pay” version). So I was very happy to find that MSE is now available as a totally free add on for all licensed Vista and Win7 users. My recommendation: PandaCloud Antivirus upside: best free choice. possible downside: need stable internet connection. My second choice: AVG Anti-Virus Free Edition upside: free, mature product. possible downside: beginning the slide towards bloat. And finally – always keep your system updated with Windows Update and install all Service Packs from Microsoft. Virus software is sold based on fear. For most users it is the fear of the unknown – because they hear the buzzwords like “worm”, “trojan”, “hacker”, “rootkit”, and don’t really have any technical understanding of what these dangers actually refer to. Virus companies always tend to take advantage of this fact by adding more and more unnecessary features instead of focusing on the basic core feature set which is really all that most users need – anti-virus. So as product lines mature, the product usually goes from “virus protection” to “firewall”, “link scanner”, “e-mail scanner”, “malware”, and even into meaningless items like “shields”, “innoculation”, “cleaner”, and so on. About this same time, a few years back now, I discovered Grisoft free AVG. Not only was it apparently built to use modest system resources, it also consistently scored very well on major comparisons of virus software. But the amazing thing was that it was free for personal use! AVG is still a good choice for Windows users who want a good, free anti-virus software. But there are a couple of negatives that have creeped in over time that have finally caused me to abandon AVG. Firstly, about once a year AVG does a major version upgrade and cuts support for the previous version – forcing the user to upgrade to the new version. This is not such a bad thing in itself because the product is free anyway, right? Theoretically it is even good because the product has good suport and all resources are being devoted to the latest and greatest – no need to try to continue legacy support on old versions. The problem is that everytime they make users upgrade, they shuffle their website and hide the free version very deeply. So I recommend AVG Free to all my friends (believe me, a *lot* of people ask me which virus software they should use) and then my friends go to the AVG site and see the paid version only. Some of them grumble and just pay the fee (which, like most anti-virus products these days is an annual fee) and some of them come back to me and complain because they can’t find it. I guess it is not as bad as products that nag or show constant ads but it is a little irritating that they have to “trick” users into paying like this. Speaking of ads, they have also started showing ads on the product in the last couple of versions. Again this, by itself, is not enough to make me switch if the product is good enough. But the final straw is that I am starting to sense the same bloat in AVG’s product that I saw happen in Norton’s. The newest version (9.0) seemed a bit heavier, and there are now many other options – toolbars, rootkit protection, link scanners, business versions, etc etc etc. A few months ago I began watching a free anti-virus contender called PandaCloud AntiVirus. The philosophy is right – minimal system resources – and there is a new technology in this product which finally feels like its time has come – Cloud Computing. PandaCloud installs a minimal client app but the virus definitions and most of the processing is done in the “cloud” (another way of saying on their servers). So your personal computer doesn’t have to use so many resources. I like that! Also, I watched this year as PandaCloud beat AVG in a couple of big computer magazine’s test results. These test ranked products based on how well they detect viruses (which is why I use an anti-virus product!) I installed PandaCloud on one computer to try it out about a month ago and within a couple of weeks I had removed AVG and installed PandaCloud on every one of my personal computers at home and at church. I like it! I ran a few test virii at it and they were all easily handled. It is simple, lightweight and unobtrusive. If the computer magazines can be believed it is also better at detecting viruses than any other free anti-virus available and just as good as the most expensive commercial products. PandaCloud is supposed to release a major upgrade in the next month or two. If they show that they can handle upgrades better than AVG I am definitely going to be recommending this product to all my friends and churches that I work with in 2010. After months of slow death and then a year of no apparent life except one short blog article by Matt Mullenweg, Podpress is once again under at least maintenance-mode development. Thanks to Tim Berger for coming to the rescue. The latest version as of now is 8.8.5 beta, which I am currently running successfully on yokosukachurch.com and the current stable version is 8.8.4 which is sending podcasts out on a few other church sites that I maintain here in Japan. Years back podpress was the undisputed best plugin for podcasting in WordPress but then the original author suddenly stopped maintaining the code. He promised to return to the project “soon” but eventually even his most ardent supporters began to disappear from the forums. Finally even the support forum got shut down, ostensibly because of spam, but more likely because the grumbling against this developer was getting pretty loud. I can’t cast stones here because it has been years since I touched my active-x controls on shrinkwrapvb.com and I still get weekly, sometimes daily requests for support on those. Life can make one busy and priorities can change. But in order to keep using Podpress I have had to hack and patch on every install and every upgrade since about WordPress 2.5. This brought me no joy since it seemed I was fighting a losing battle – with the original author being long gone, never to return. I actually almost switched to another plugin or two for the same functionality, but the problem of migrating all the back episodes of my podcasts kept me making small bugfixes to podpress. Until – now! Once again I am using the official svn repository versions of podpress and the only hacks I need to make are on sites where I want to add Japanese text or custom features/graphics. Podpress lives on to fight another day. If you happen to be a pastor or volunteer at a small church which is trying to embrace the flood of technology available in the 21st century then perhaps the title of this article caught your eye. Did you know that if you own a domain name and have the technical expertise to set your own CNAME records (or at least have the patience to follow Google’s detailed online help), Google will give you a free, hosted, productivity suite along with some seriously significant amounts of disk space located in the cloud. That’s right. The standard version of the GoogleApps in-the-cloud, Web 2.0+, Microsoft-busting, service suite is available for free for personal use. If you have a personal website or blog, I recommend that you try it out right away. I did this a couple years back when this was still bleeding-edge and Google marketing was calling it “Google Apps For Your Domain.” Since that time, Google has not only shortened the name, they have added feature after feature, they have had (almost) flawless uptime, and they have continually increased the disk space allowance to users. 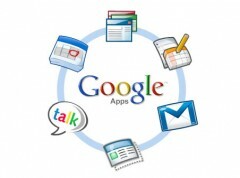 If you are a GMail user then you are probably already familiar with many of the apps – mail, calendar, contacts, chat… Adding it to your domain allows you to brand these apps with your organization’s logo and get an amazing combination of great apps, great hosting, and great collaboration tools. Sure is nice that all that stuff is backed up to the cloud too. It is cool that I can easily add anyone I want as a user on my domains productivity apps from any computer and collaborate, share, chat, etc. etc. etc. Anybody want an old Windows Server box to use as a doorstop? I am tired of trying to keep up with patches and admin. Let Google do it for me! I recently checked out the Official Google Apps blog and noticed that two of the last big hurdles to using GoogleApps as my main productivity suite have been cleared by the G. Team as we head into 2010. Just recently they (finally) released a stand-alone contacts page that can apparently be shared across everyone in your domain. The other new feature for this month is that now users can upload *any file type* to their domain accounts. This is big because it gives you an immediate “G-Drive” type of backup location. You can upload important stuff as a zip archive or whatever format you prefer and have it in case of a local computer disaster. With GoogleApps folder sharing feature you can even create a dedicated shared folder and share anything you want across your organization just like many of us do on our local area networks. Only this is hosted on the cloud… sweet! At this initial release the limit is 1 gig per user on “unconverted” files (which means files that can’t be converted to online docs, spreadsheets or presentations). Hopefully that number will also go up soon. Do you have experience with GoogleApps? Love it? Hate it? Join the forum via the link below and leave a comment or question. Anyone from the Western Hemisphere who has seriously tried to master the Japanese language knows that it is not a trivial task. After studying at two American universities and under two Japanese private tutors, I did what many before me have done – I focused on speaking and listening and let my puny Japanese reading and writing skills atrophy. It would certainly be cool if there were a universal translator (ala Star Trek) – I’d even settle for a Babblefish to stick in my ear (ala Douglas Adams). In the meantime there is Google Translate. However, the practical usefulness of translation software is still ridiculously limited as anyone who has actually tried to use it will quickly find out. Just try picking a phrase in English at random, translate that phrase into Japanese and then translate it back into English using the same software. Should at least be close, right? OK, since I love the Bible I will choose a simple passage that source. How about an excerpt from Luke 2 (as famously quoted by Linus on “A Charlie Brown Christmas“). So Joseph also went up from the town of Nazareth in Galilee to Judea, to Bethlehem the town of David, because he belonged to the house and line of David. He went there to register with Mary, who was pledged to be married to him and was expecting a child. While they were there, the time came for the baby to be born, and she gave birth to her firstborn, a son. Because he is a line of David, Joseph, and therefore belongs to the house, the Jewish town of Nazareth in Galilee, the Bethlehem, went to the city of David. He and Mary went to register the child and was hoping that was promised to marry him. While were there, the time is coming to birth a baby, her firstborn child, gave birth to a son. For those of use who have studied Japanese since the dark ages of the Internet, when Al Gore was laboring to create Arpa-Net and Darpa-Net (insert sarcmark here), the greatest free gift to Japanese scholars was Jim Breen’s EDICT database. Pooling the resources of Australia’s university students who were majoring in the Japanese language, Professor Breen did something incredibly farsighted. He created a free English-Japanese dictionary for foreign students of Japanese and freely made it available to all on the Monash University website. Building on this great basic research, Todd Rudick built Rikai.com which can be easily used from any webbrowser for either translating Japanese text or (by entering a URL directly) browsing entire Japanese websites. The genius of Rikai.com (rikai means “understanding” in English) is that it is NOT a translator but something akin an automatic popup dictionary. If you know how to speak Japanese but your kanji skills are weak, this is better than a translator. Try it and you will see what I mean. I recommend using some kind of ad-blocker to remove the annoying dating ads that inhabit the sidebars, but the functionality is worth the effort. Rikai.com is cool, but I have saved the best for last. Building on this idea and expanding on Todd’s initial attempt at a browser plugin version of Rikai.com, Jon Zarate has built an excellent plugin for Firefox called Rikaichan. As I write this the current stable revision is 1.07 and 1.08 is in the late beta stages. This is, hands down, the very best tool I have found for browsing Japanese websites. It is fast, slick and elegant. It also has the full power of the original EDICT database plus alpha and makes it all available as tooltip rollovers and hotkeys from your Firefox browser. There is also a work-in-progress Chrome version here called rikaikun. Do you know any other good tools for web-browsing in Japanese? OK, just to round out the list here is one more option for those who have decent Japanese skills but need a little help with the kanji. The furigana injector add-on is available for Firefox and Chrome and does just what you would expect from the name. If you have any other tips for reading Japanese websites, let me know via the forum link below. Share your tips and be blessed!